Airbus wide-body aircraft display, 2006 Farnborough Airshow. Courtesy MilborneOne/Wikimedia Commons. Every two years the world’s most important defence and civilian aerospace manufacturers decend onto a rural Hampshire airport to show of their latest, greatest, and (in some cases) most lethal hardware. 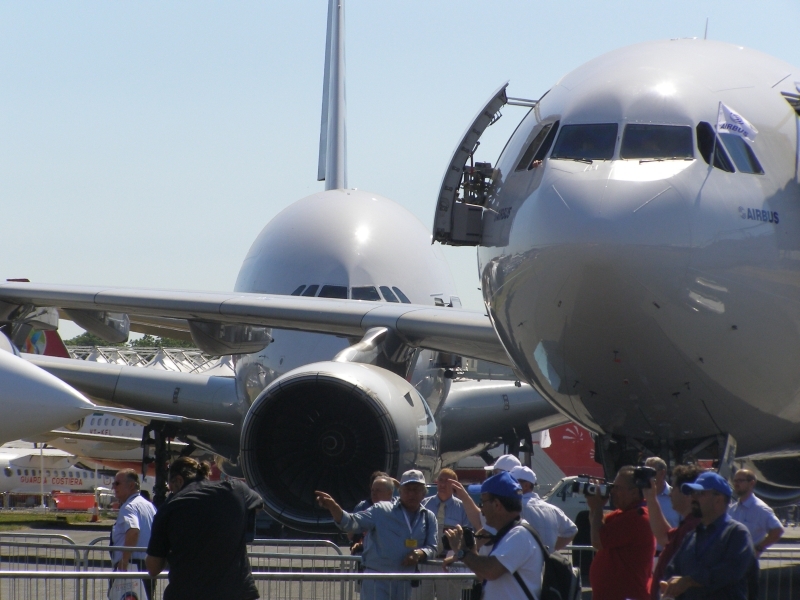 At the 2014 Farnborough Airshow Boeing and Airbus competed for orders of their next-generation 787 and A350 wide-body long-haul aircraft; Boeing went so far as to fly its aircraft through a stunt routine to convince potential buyers of the 787’s manoeuvring capabilities. Wifi manufacturers announced roll-out of their flight-based technologies on major airlines. Bombadier and Embraer announced new regional jetliners, and the British, French, and American air forces announced orders and program extensions. In June 2015 Farnborough International, the show’s organisers, publicised plans to begin a new airshow in September 2017, in Chengdu, Sichuan, China. But the Shoreham airshow crash on 22 August 2015 – in which 11 people died – serves to remind us of the inherent dangers of bringing low-flying aircraft, often still undergoing flight tests, so close to crowded audiences. Airshows, like airspace, constitute contested geographies, spaces of performance, politics, power, and technology. Despite their prominent place in aviation history, few geographers have critically examined the airshow as contested space. In a 2001 Area article, Heather Nicholson (Leeds) recounted the importance of such specific sites as airshows in childhood geographies; the airshow, like zoos and carnivals, become privileged spatial memories; important markers in a child’s expanding world (p. 134). Matthew Rech (Newcastle) has redressed this gap in his 2015 Transactions of the Institute of British Geographers study, ‘A critical geopolitics of observant practice at British military airshows’. Approaching airshows through what Fraser Macdonald termed ‘observant practice’, or how “types” of seeing (e.g., ‘gazing’, ‘glancing’, staring) can manipulate — and be manipulated by — show controllers through dazzling demonstrations, fly-bys, and promotion or suppression of particular images and narratives (p. 537). Site selection for instance can play important subliminal roles, the selection of a “country site” as Farnborough, intended to evoke a timeless England, or Brize Norton, a famed RAF base with barriers, signs, and other symbols of ‘secrecy, security, and safety’ (p. 538). Such images convey strength, ‘prowess’, ‘an architecture of control’, and nationalism, as well as more child-like wonder, amazement, curiosity, and sheer excitement. The consequences — particularly from a fiscal standpoint — can be huge. Rech’s argument has a strong historical foundation, lending additional credence to his contemporary, sociological observation. From the 1910s, airshows conveyed the ‘rhetorical force of flight’: a host of metaphorical meaning ranging from the airman, who seemingly took on superhuman qualities wherever he (or she, from the 1930s) went, to the ‘futurist aesthetic’ of the aircraft themselves: their glistening fuselages, engines, the triumph of metal over nature. Rech is careful, however, to also stress what is not displayed: the most secret, most advanced, most important aircraft. This balance between display and intimidation, and secrecy and the threats of the unknown, remains central to any airshow geared toward military hardware. The audience undergoes a physiological and psychological process when attending an airshow, particularly one with air force equipment. In what Rech refers to as ‘technofetishism’, the moral barriers between casual weekend observer and the lethal equipment on the other side of the tape blur; internal questions concerning the aircraft’s or system’s purpose is clouded in excitement and pride in the nation-state (pp. 541-42). Aviation Week (2014) Farnborough airshow accessed 6 November 2015. Tovey A (2015) Farnborough flying high as it lands China air show deal The Telegraph. Johnston C and Jenkins L (2015), Shoreham plane crash: seven dead after fighter jet hits cars during airshow 22 August. Nicholson HN (2001) Seeing how it was? Childhood geographies and memories of home movies Area 33(2): 128-40. Rech MF (2015) A critical geopolitics of observant practice at British military airshows Transactions of The Institute of British Geographers 40(4): 536-48. This entry was posted in Announcements, Area, Transactions of the Institute of British Geographers and tagged Boundary Crossings, Britain on November 6, 2015 by Benjamin Sacks.